It’s been quite awhile since I’ve posted regularly to my Journal, mainly due to all the interior design project work that’s kept me traveling. 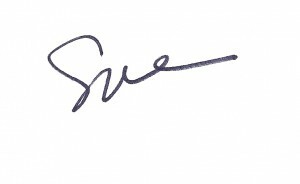 With S. B. 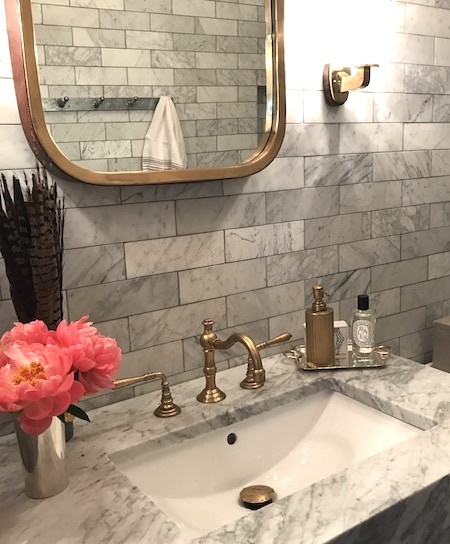 Long Interior’s website launching this week, I wanted to get back to posting and share a powder bathroom gut renovation recently completed at my Highland Park home. I’ve always loved the classic, chic design of Lenny Kravitz’ Paris apartment bathroom – photo above. The contrast of the white and black veined marble against Pedro Friedeberg’s gold hand chair is simple and stunning. 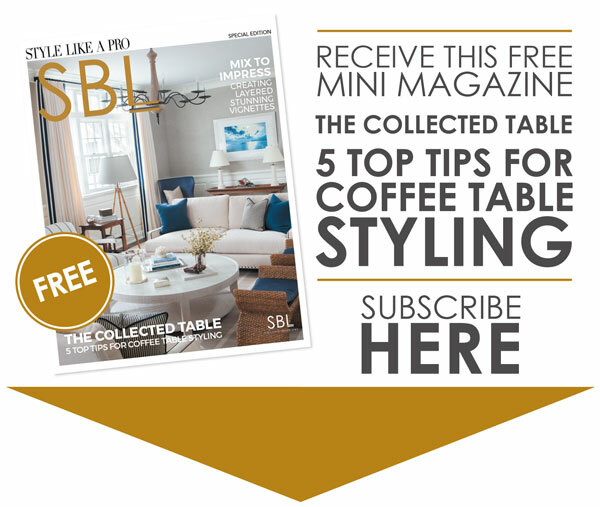 After sorting through all of the home décor inspirations that I’ve saved over the years, this image was my inspiration as it had the right modern traditional mix for the bathroom renovation. 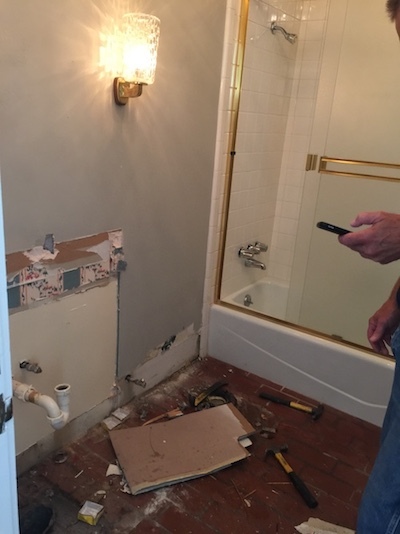 I thought it would be fun to share photos of the renovation from start to finish and my thoughts about the design. 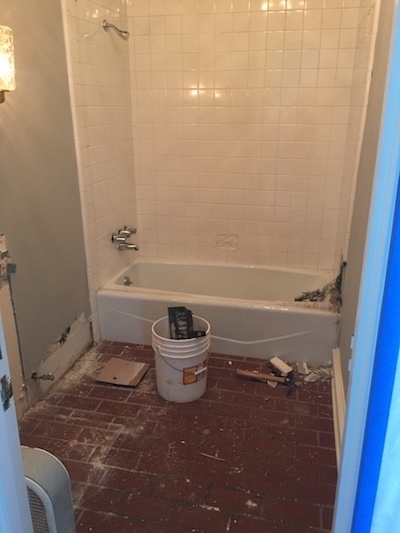 Before photo: This dated 80’s powder bath that doubles as a pool bathroom was in serious need of renovation since we moved in a few years back. 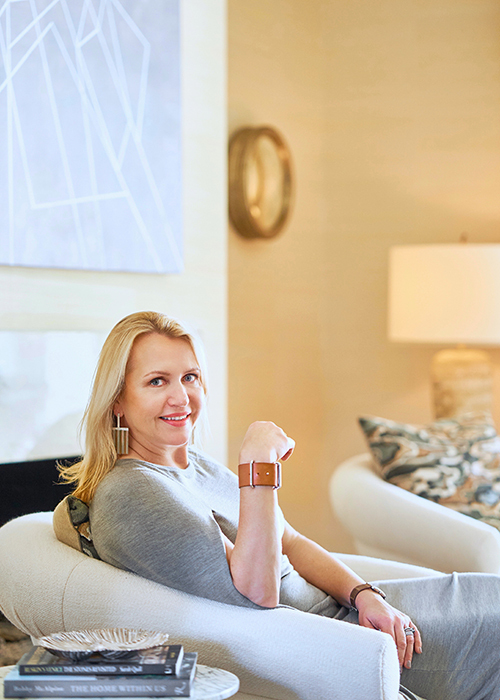 I wanted to update everything and in the process, lighten up the space, make it elegant but also super functional. The demo begins. 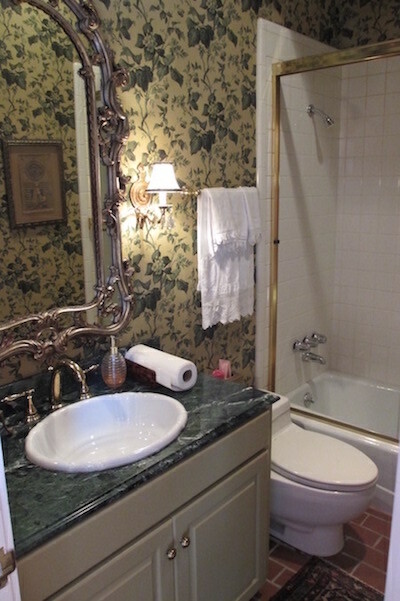 Though it’s great that it’s a full bath, the tub is not functional for this bathroom and crowds the space. I decided to convert it to a shower. 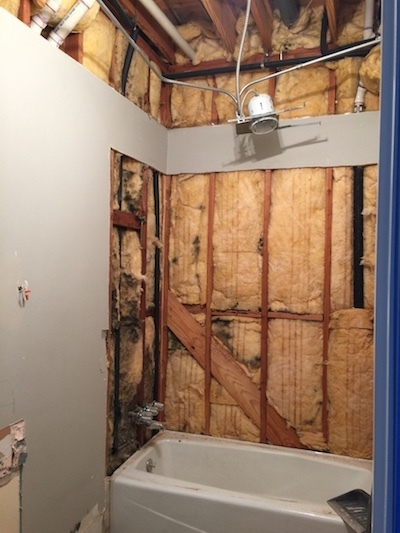 We started by gutting the bathroom and the soffits to increase the ceilings height. With the tub removed, the floor space is larger and the room feels bigger. 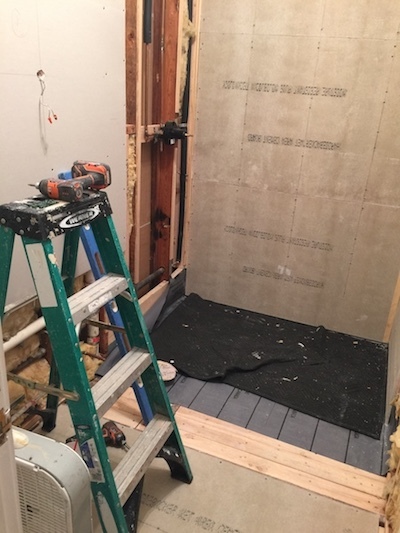 Waterproofing the floor of the shower which is set on a slight angle back to the wall to move the shower water towards the channel drain which will be installed at the back wall. 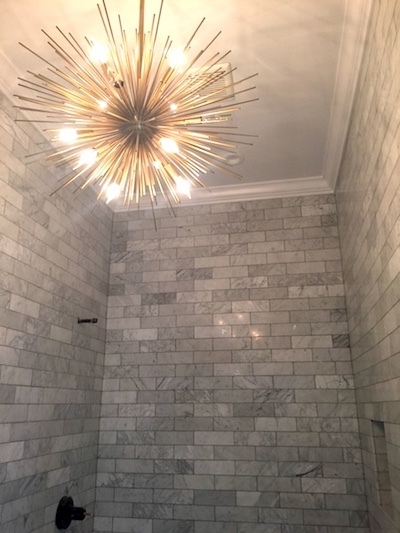 I chose this classic 3” x 9” Carrera marble tile and took it all the way to the ceiling. I love the clean, dramatic look, but also that it’s perfect for the open shower. Stripes are one of my favorite design details and I wanted to incorporate it somehow in this bath. So, I decided to do it on the floor. These taupe 2” x 24” porcelain tiles in two tones of warm gray were the perfect addition to the neutral palette. 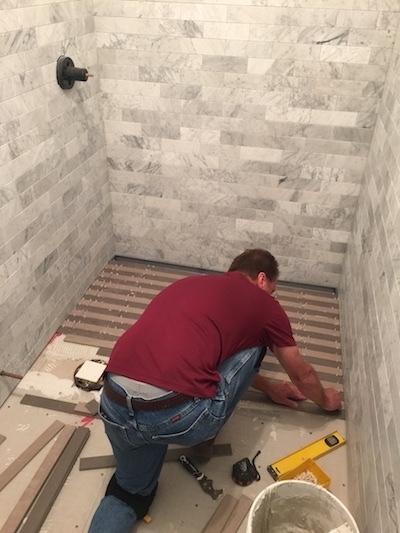 The drain’s top will be finished with one of the tiles to complete the striped floor. 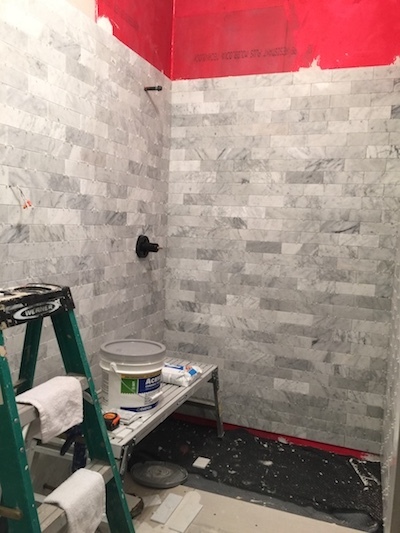 The material palette of white marble, warm metallic hues with accents of black is coming together. The Sputnik style brass ceiling fixture & unlacquered brass fixtures adds warm contrast to the cool grey walls. 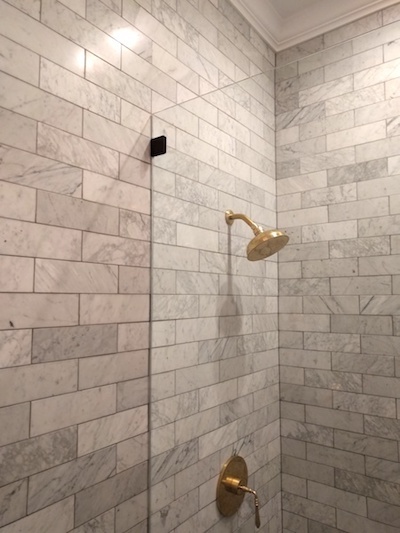 In this tight space, I installed a simple fixed glass shower panel with dark oil rubbed bronze clips between the showerhead and the toilet – to keep the room as open as possible. The clips coordinate with the blackened metal sink legs. 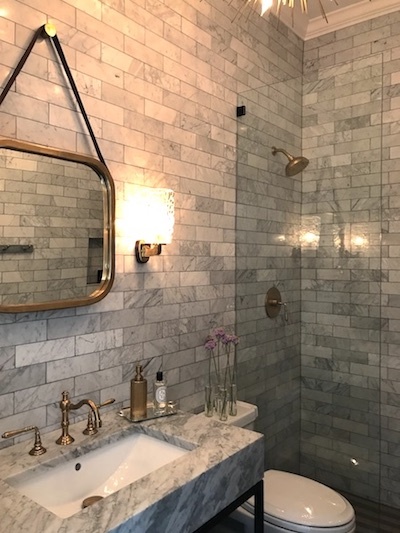 The finishing details: 1960’s Modern glass and brass sconces, leather & brass hanging mirror, a vintage steel and brass coat rack for multiple pool towels, and fresh flowers and pheasant features for a pop of interesting color.